XYplorer is a tabbed file manager featuring a powerful file search, preview facilities, a customizable interface, and a large array of unique ways to help automate frequently recurring tasks. The program's intelligent features target power users. As the program has gone commercial, we are linking to the last freeware version from Archive.org. How to extract: Download the "No-Install" ZIP package and extract to a folder of your choice. Launch XYplorerFree.exe. XYplorer has a strange support for unicode - it can manipulate files with unicode characters (In particular, Georgian unicode characters) in their filenames, i.e. it can show, copy, move, delete, etc. them, but when I try to rename a file, it writes just "question marks" instead of characters. And this applies to both free and paid versions. @Wallax: thanks for checking it -- update reverted. They did update their shareware version, 1t's a real 15.9. As for the free one, it's still at 15.8. As far as I understand, it's kind of their company policy: the free version is released later than the paid one. My belief is the download page hasn't had its text properly updated. It is version 15.80.0100, not 15.90.0000. Portable device support is in the "Pro" version, but not in the free version. Portable device support is currently still in heavy development for the last few weeks so it's not fully working yet and is only available in the beta versions. As for your other problems, it works perfectly for me so there might be something unique about your installation so go check out the forums and they will try to see what could possibly conflict with it. Although just to note, contrary to what you normally do in Windows Explorer, you want to Shift-Select by clicking on the file names rather than the icons. @ghiebert - You should probably file bug reports with the developer of XYplorer. But, thanks for letting us know! I have vs 14.40.0200 free, which I obtained a few months back to try out. While it looks and runs really well, it has a few serious flaws which will keep me from upgrading or using it at all. First of all I have trouble selecting multiple files for a move or copy when using Shift-LeftMouse, sometime I use continually. Second, I cannot simply drag an image file into a Googgle email. I have to try 3 or 4 times until it finally drags over. Third, I simply cannot see my Canon camera when it is connected, and I don't think I can see other portable drives either. Perhaps a slightly newer version has fixed that. These are basic functions of any file explorer but they are not working properly at all, however check it out for yourself. Otherwise, in normal use I have no issues with daily tasks. It has lower, overall memory usage than CubicExplorer (the file manager I currently use), but the menu and admin interface is a little clunky. I might switch to this down the road. FYI: XYplorer was not allowing me to modify the date stamp of an MP3 file, telling me the file was in use somewhere else, which it wasn't. I just discovered why this was happening: In XYplorer's configuration dialogue I had enabled previews for audio and video, and even though the MP3 wasn't playing at the time, just having it selected was apparently enough to block access to it, probably because it appeared in the preview tab of the info panel, which I couldn't see, since I was in the properties tab. Temporarily disabling audio and video previews solved the problem, so it's not really a bug. @Procky1: I just experimented with that. When XYplorer is set to replace WinExp on my system, its registry entry appears under HKCR\Directory. If I uncheck the replace option, the key will remain there unless the Explorer context menu option is unchecked at the same time, which removes the registry key altogether. XYplorer can then be successfully relocated and those options re-enabled if desired, which of course will automatically create a registry key with the correct application path. Just started experimenting with XY and discovered a significant issue. If XYplorer files are moved AFTER the Replace Explorer option has been used, even if the option is then disabled, Windows will still look for the files in the old location, and will return the message "Application Not Found" when you attempt to launch it. 1. If possible, install XYplorer in a permanent location before setting the Replace Explorer option. b. In RegEdit, find XYplorer. c. In the Command key, replace the old path with the new one. 3. Start XYplorer in its new location and set Replace Explorer. Cool application, Andrew! I was using Explorer++ for several years and finally became impatient with its many never-addressed bugs. In that application, the files can be moved without crashing the program. It would be a simple matter to have XY overwrite the old registry keys when it is moved to a new location. Keep up the good work! @Don: Thanks for the info. I updated the dependencies and unicode support settings. On the other hand, "Application folder" follows the convention here on portablefreeware.com, even though XYplorer writes settings to a folder named "Data" within its folder. Saying that it writes settings to "Application Data" would make it wound like it writes to the C: drive. Also, this is an amazing piece of software, I've preferred FreeCommander for years, and I had no idea that XYplorer had so many great features! I'm a newcomer to XYplorer. After trying XYplorerFree (13.70.0100) on Windows 7 for only a few hours I'm already hooked. This is now my file manager of choice, as well as my WinExp replacement. It has so many useful functions and such flexibility that WinExp can't hold a candle to it, nor can any of the other 3rd-party file managers I've tried. The help file is superb and up to date, and has already shown me most of what I need to know to use the program efficiently. Dependencies: None (apart from Windows itself). The toolbar IS customizable in XYFree. And if you needed a reason to upgrade to the pay version ($29.99), to quote the author, "How many file managers do you know that can make a cup of coffee?" ... the pro version does. Honest. If you like FreeCommander, you'll love this puppy. @abid is right ... a TON of new features, highly customisable, and FASSST! A new version of XYplorerFree is available since 2nd Jan 2014. It has huge set of new features and still portable. Indeed the download link seems to have been fixed. Thanks, IanFromBarrie. I just downloaded the program and ran it successfully, Shodan816. Like Buckster, I prefer the two-pane features of FreeCommander, but lots to like in this program. Is it just me, or does there seem to more than the usual amount of unsubstantiated p*ssing on this program? Maybe a Mod might wanna look into updating the 'DirectDownloadLink'. Also there is no time limit on advanced features nor a required paid registration. If you're like me and find the new versions of Windows Explorer and File Search in Vista and 7 to be horribly mangled and mutated descendants of the once pristine versions in earlier incarnations if Windows, then XYplorer is a breath of fresh air. Seriously, it's the only reason I haven't thrown my computer out the window in frustration. Don't let the lack of maintenance fool you; XYplorer Free is in my opinion still the single best freeware Windows Explorer replacement. I've tried several alternatives, but XYplorer is the only one that handles tabs right. The Search feature (Find Files tab at the bottom) is the old Windows style, minus the stupid dog but plus dozens of new options. It also duplicates the context menu of Windows Explorer, including additional items added by programs plus many other convenient options that should have been in . Those three features together would be enough, but it also integrates an image thumbnail browser that's better than the one in Windows or even dedicated graphics browsers (you can view thumbnails of images and all the detailed file info at the same time), a file preview for file types it recognizes, a hex viewer, directory list generator, opening the command line already set up in the folder that you're looking at, and a million other useful features that the developers threw in just for the heck of it. I still haven't discovered them all, and I've been using XYplorer for years. You have to take some time to get used to it, but try it for a week and you'll wonder how you ever got along without it. It's now the very first thing I install on a new computer. Seems it is not freeware anymore. "The XYplorer Freeware Edition (aka XYplorerFree) has been discontinued and is no longer available for download. Why? XYplorerFree was virtually identical to XYplorer 5.50.0001, released 17-Dec-2006, a great file manager in its days. However, time is going on, and it's simply not responsible to offer a lifeless piece of software without any development, without bug fixes, without adjustments to new operating systems, etc. Thank you very much for informing the webmaster of the site that linked to this page that the Freeware Edition of XYplorer is no longer available!" Recently tried this program and looks pretty promising it but it needs "double pane" option. As a very devoted and loyal XY user of over two years, I wanted to respond to the above comments about memory usage. As a quick test, I used XYplorer 6.80.101 (paid) compared to Xplorer2 1.4 (lite/free) and had four tabs open in both. XY did use slightly more on my W2K sys (about 9% diff) at 16.5MB vs 15.1MB but this was not a perfect test case. This difference is small enough so as not to bother me. One of the main advantages that XY has, to me, is the ability to interact on daily basis with Donald Lessau (the developer) and others in the forums, and help guide creation of new features. He is very responsive to user issues and has released a fix of the rare bugs via beta vers within the hour on some occasions. There is also a up-to-date user maintained wiki for additional documentation available. For other reviews: XYplorer was listed in March 2008 issue of PC Magazine as of the "157 Best Freeware", and was the ONLY file manager so listed. It was also picked by Leo Laporte on Windows Weekly #37 netcast as "Pick of the Week". I think what joby_toss reports is a rare case or rather the first case i have heard of. it never goes beyond 4mb here. infact i chose XYplorer over others just for being resource friendly for so many things it does. Additionally the above stated fact that advanced features are not available after 30 days is wrong. XYPlorerFree (a free version of commercial product) has all features with no time bar. Been using this gem for a couple of years now. Tried almost every Windows Explorer replacement available and this one tops them all. It's small, fast and does SO many things that Windows Explorer cannot do. Far too many features to list here. Give the trial version a test drive. If you don't, you're missing a very special opportunity. 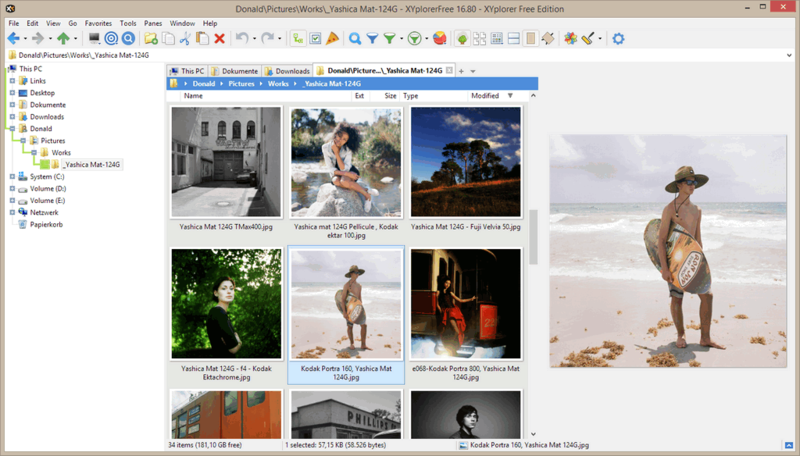 There is now even a free version with many of the same features as the full version. Keep up the great work, Don ! 3 years later and > 20 mb is a small memory footprint? besides that what really turns me off was customizing the toolbar and saving the settings is a professional liscence only feature. @Mark: it is strange that you find this a memory hog, because when i first screened several file managers in Oct 2005 one of the main criteria was memory and I chose XYplorer for small memory footprint apart from other cool features. found this to be a huge memory hog and slowed up my machine, back to a43 for me.